Aria Vanir, the tween heroine of “Mystical Aria: Seeking the Gallion Queen,” learns tough lessons about repressed anger and love from a spiritually advanced alien commander, Mitushi. He, in turn, discovers the best about humans by observing Aria’s first memory as a newborn. In Jean Neff Guthrie’s novel, Aria Vanir psychically connects with good aliens—the Gallions—and invites them to visit her in Virginia Beach. Mitushi’s mother, Queen Supreme Nashata, accepts the invitation and travels on a diplomatic journey to Earth in a superspaceship with the royal family. Before Aria is permitted meet the queen supreme, she must master a challenge. 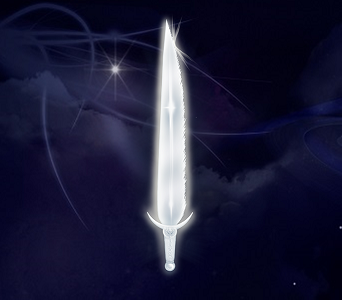 To aid Aria with her trial, the aliens gift her with the Gallion Sword of Purity. The Sword of Purity holds white light and reveals truths. Like the Earth legends of King Arthur, only the true owner of the Sword can lift it and see its messages in the blade. For the challenge, Mitushi instructs Aria to gaze into her sword and ask, “Show me my greatest enemy.” Rather than a monster or evil terrorist, Aria sees images concealed deeply in her subconscious. Bringing them to her conscious mind releases a horrendous flood of rage that Aria unknowingly has repressed for years. What did Aria see and why were these images tainted with so much anger? How did Aria use her Sword of Purity from the Gallions to release her repressed rage? What was the message about love that Aria had hidden so deeply behind a fortress of fear? What was Aria’s first memory that impressed the spiritually advanced alien leader? For the answers to these questions and more about Aria’s stories, go to www.JeanNeffGuthrie.com. The journey starts with the first word.